A 13-year-old girl's quick thinking and bravery helped nab three teenagers who police say broke into her San Jose home. The girl, who NBC Bay Area is not identifying to protect her safety, was home alone last week when she heard a ringing door bell, followed by pounding at the door. "I go to the peep hole to check who it is, and it doesn't look like regular people I'd see at the door," she said. The girl, who didn't answer the door, said the teen boys at the door looked like they were up to no good. "I had a bad feeling in my stomach," she said. The girl then rushed to her bedroom to call her father and told him she felt someone was breaking into the home. The teen then locked herself in the bathroom — hiding in the tub so the burglars wouldn't see her feet under the door — and called 911. 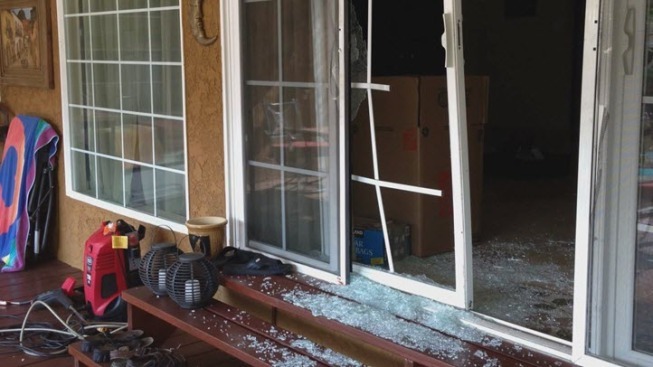 The burglars eventually got into the house, leaving behind a trail of broken glass and a busted sliding door, and the girl did what she could to keep quiet until her father and police arrived. She texted her dad instructing him not to call her out of fear that they would hear the ringing and discover her hiding spot. Police sent about 10 patrol cars to the house and were able to catch all three suspects. "For me, it was amazing," the girl's father said. "I told her the same day I was really proud of what she did."